Planning a trip out of Melbourne this winter? 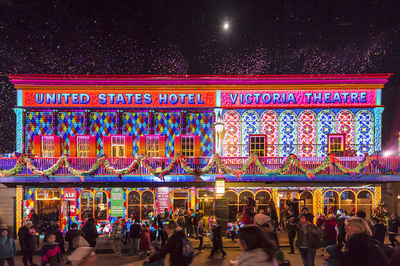 Well then, you must consider a visit to Sovereign Hill for this July's Winter Wonderlights Spectacular. 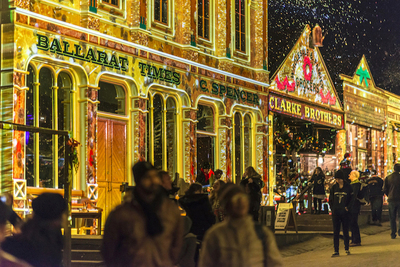 Winter Wonderlights at Sovereign Hill is an annual event in Ballarat's historical museum, when magical light displays project onto the facade of the Victorian style buildings within the township. Over 20 buildings become lit with yuletide themed animations and over 10km of fairy lights decorate Sovereign Hill's gardens. Don't think for a moment it's all about night time festivities because during the day, Sovereign Hill becomes the perfect Victorian destination to embrace Christmas in July. The township of Sovereign Hill will be sprinkled with snow flakes, falling at regular intervals. Couple that with Christmas decorations, the smell of Chrissy treats and spices in the air, and traditional Christmas-themed pantomimes and you've got yourselves a winter wonderland extravaganza. When dusk sets in, Main Street will twinkle with the most incredible light projections, not dissimilar to those you see at White Night Melbourne. Enjoy a spectacle of large-scale Christmas themed animations and projections, which this year promises to be bigger and better than ever. Will you can catch sight of the mischievous Gingerbread man as he hides within the building projections? 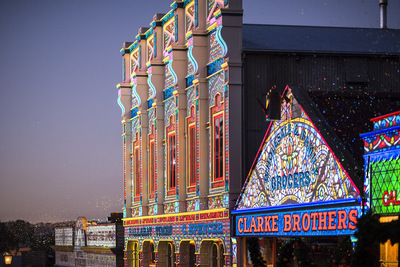 Head to Winter Wonderlights at Sovereign Hill this July and see! When: Saturday 1 July – Sunday 30 July, 2017. Open daily from 10am. The ‘Winter Wonderlights’ show will start each evening after 5.45pm.